Our Odo collection exhibits the finest Grace Estate has to offer. With these wines, we prove there is elegance in boldness and substance in creativity. Here you will find wines few others dare to make. 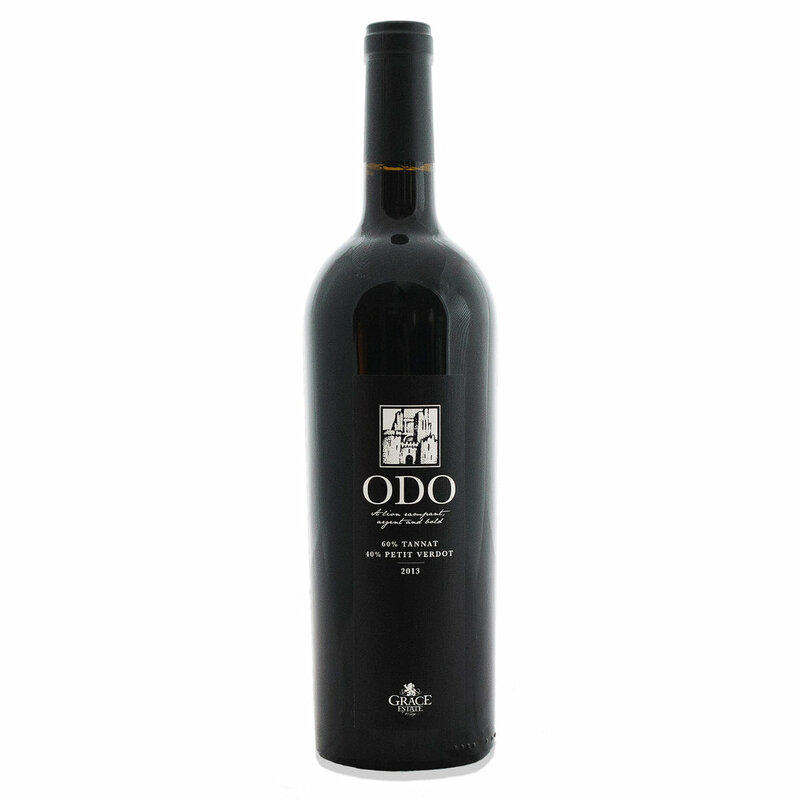 The 2013 Odo showcases 60% Tannat with 40% Petit Verdot. This wine shows great depth on the nose, full of dark cocoa and tobacco. The palate is more fruit-forward with jammy plum and boysenberry on the front. Then, the tannins take over for a long, leathery finish. Perfect for your next red meat and red wine night. Enjoy through 2023. Odo, the Count of Champagne and Aumale (later Albemarle) lived from c. 1030-1115. He famously accompanied his brother-in-law, William the Conqueror during the Norman conquest of England. He was briefly imprisoned by King William II in 1095 after a failed rebellion sought to place Odo’s son, Stephen (see our Estate Merlot) on the throne. He outlived his wife, Adeliza (see our partnering semi-sweet white wine), but together they had three children; Stephen, Judith, and Adeliza II. Modern historians cite Odo as the primogenitor of the Grace (La Gras) family. Adeliza is an off-dry white wine from the Petit Manseng grape. Aged in Cognac barrels, the often lemony Petit Manseng then transforms to a sweet and smoky, fuller bodied wine. Enjoy as an aperitif or digestif. The front label reads, “Devoted, sweet, but powerful.” Precisely the way to describe Adeliza, Countess of Aumale (later Albemarle). She was born c. 1030, sister of William the Conqueror, who conquered England in 1066. Her third marriage, to Odo of Champagne (see our Estate Odo), bore three children,Stephen (see our Estate Merlot), Judith, and Adeliza II, and began the Le Gras (Grace) family line. Most significantly, Adeliza was one of the few women to have extensive lands in both Normandy and in England in her name at the time, making her one of the most powerful women in Europe! Our 2017 Estate Ice Wine is a completely natural ice wine picked after an early November frost. The aromatic nose contains tradition Vidal Blanc stone and tropical fruit notes, brightened by honeysuckle and spring flowers. Most importantly, the wine maintains acidity on the palate throughout. This brings critical balance to the wine, with flavors of candied lemon, red apple, and apricot; so dynamic you forget it's sweet!